Dogs chasing cars: The value of accurate data analysis. Taiichi Ohno used to say “Where there is no standard there can be no Kaizen”, which can be translated to “you can’t improve what you don’t measure.” However, these two sayings have a critical missing element... the term “accurate”. Many organizations fall victim to poor data interpretation and instead of improving their processes they do them more harm. Good data analysis is an integral part of good idea management systems. Breaking down the raw data and identifying trends in idea quality, user participation, and aging of ideas can help program administrators improve the process, however, the wrong slicing and interpretation of the metrics can quickly hinder it. This concept always brings me back to my love of golf and in particular one of my pet peeves… the “Putting Average Leaderboard”. It has always struck me as odd that one of the statistics most used by sports analysts to measure a pro golfer’s performance is their putting average. Normally, when a golfer has a bad year following a good one, they will usually look at their putting average as the culprit for the fall from grace. Needless to say, putting accounts for close to 50% of strokes on a golf course, and putting averages are mostly the result of a golfer’s ability to get the ball close to the hole with the other 13 clubs prior to using the putter to finesse the ball into the hole. When there is only a 0.10 average put per hole separating the top putter and the 80th on the list, and when you realize that 2010’s top two money leaders, Ernie Els and Phil Mickelson are ranked 54th and 53rd respectively on the average putts list, it is time that analysts realize that this list does not come close to predicting how good a golfer is. It’s a matter a fact that the top golfers find themselves putting for birdie more often than the golfers at the top of the putting list. The golfers with the lower averages are usually the ones having to chip and putt for par, and these are precisely the ones we seldom hear winning a green jacket and the first ones in line to join the Nationwide tour. For Phil and Ernie, if they were subject to ‘management decisions’ made by interpreting the data, they would probably be sent to ‘putting-re-certification’ class. Unfortunately this would cause them to spend time away from sustaining and developing their other skills, and would likely lead them to fall off the top of the money list. 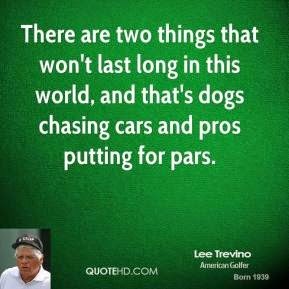 The irony would be that they would likely climb up the putting charts, giving ‘management’ the impression that the re-certification classes were effective and failing to realize that they have hindered their ability to be top performers by placing them in a position to sink more ‘PAR’ putts. Thus, from the analytical sense, the putting average list has no value and the data represents a red herring, that if followed as most analysts interpret it, would lead to good golfers losing their winning ways. Posted on Tuesday, May 11, 2010 by George R.